In the spring of 1981 I spent three months at Friends World College campus on Long Island, just outside New York City. I also stayed two weeks at a yoga-center on Manhattan as a preliminary to whatever I was going to study. So during my time in New York I got to go several times exploring a little bit of the Big Apple. I saw the City from the top of the World Trade Center, sunrise in April from high up in the Empire State Building, and even got to play guitar on a recording in a studio somewhere on Broadway. But the most epoch making thing that happened to me in New York, was the acquiring of a certain book. I remember vividly my awe and excitement when entering the East West Bookstore on Fifth Avenue. I had never seen a store like that before, since nothing even remotely similar existed back in Norway. I returned to that store as often as I could, and on one of those trips I came out the door carrying The American Ephemeris for the Twentieth Century by Neil F. Michelsen. From then on I spent time every day with that book on my lap, and it is probably no exaggeration to say that it was from that book, as a reflection of the great book of life itself, that I learned the most of what I know about the workings of astrology. I did, however, have a great teacher in Jeffrey Wolf Green in Seattle, where I lived for a year and a half. As well as learned a lot from a few thousand clients through 25 years as a professional astrologer. And Dane Rudhyar’s books were a constant inspiration for many years, and alerted me to the Galactic Dimension of Astrology where the Sun is also a Star. My adventure into Galactic Astrology started in 1991 with Mark Pottenger’s CCRS88 astrological research software for MSDOS. Eventually upgraded to the 1997 version of CCRS92. In there I found some intriguing functions which also opened a whole new world for me. Notably the possibility of getting planetary positions with Galactic coordinates. This led me to construct my first Geocentric Galactic birth chart in September 1991. In Astrophysical Directions by Michael and Margaret Erlewine I had found essential information concerning cosmic structure, which made me rethink the concept of a Galactic Zodiac for Astrology. In CCRS the Galactic Longitude positions are given with the Galactic Center as starting point. This is in accord with astronomical practice, but breaks ancient astrological principles. If we look at both the Ascendant and the Vernal Equinox or Tropical Zero Aries point, they are both created by the intersection of two planes. The Ascendant is at the intersection of the Ecliptic and the local Horizon, while the Vernal Equinox is at the intersection of the Ecliptic and the Equator. Likewise, the starting point of the Galactic Zodiac is naturally placed on the intersection of the Ecliptic and the Galactic Planes. Following the time honored principles of ancient Astrology, it then follows that the Galactic Zodiac starts at the Ascending Node of the Galactic Plane and the Ecliptic. But there are two nodes in the intersection between those two planes, one is ascending from the Ecliptic point of view, the other ascending from the Galactic. So which is the right one? In Astrophysical Directions I found the “Ascending Node of the Galactic Equator to the Ecliptic” given as 6 degrees, 22 minutes and 35 seconds after the position of the Galactic Center. But was this really the one I was searching for? For a long time I thought it was, and I started making Ephemerides accordingly. This turned out to be quite a demanding task for my computers. In the beginning they simply could not do it, since the Ephemerides I wanted to make were quite extensive. But the possibility to do it opened up for me in 2001 with a Mac G3, and then I really started working on this project. It was quite a job, and if anyone ever asks me what I was doing as the Twin Towers fell, I remember well that I was working on my Galactic Ephemeris project that day. All of which later turned into a series of pdf-files. Then, in early March 2011, (as Uranus was about to change quadrant in both the Galactic and the Ecliptic Zodiac as well as entering the 1. House in the charts for the Age of Aquarius) the publishing of my book The Homer Code through CreateSpace and Amazon became an enormous incentive to also get what became my Galactic Geocentric Astrology Series, Volumes 1 – 16, materialized that way. And as I dived into the making of Ephemerides ready for publishing, I also re-thought everything from scratch. Something which led to the typical sudden Uranian realization that I, up to that point, had made all my Ephemerides 180 degrees upside down. This had made all Timings right, but all Signs wrong. I had seen all along that the Galactic Timing was eerily interesting, and that the Galactic Signs were difficult to see, but I had not seen why until Uranus woke me up to turn everything 180 degrees around. In astronomical literature an Ascending Node is defined as “The point at which an orbiting body rises through the plane of the Ecliptic traveling northward.” Transferred to the Galactic, that would become the point at which an orbiting body rises through the plane of the Milky Way traveling northward. Part 1: Galactic Astrology Tool Kit. Part 2: Galactic Awakening in the Age of Aquarius. With listings every other day at Midnight GMT, for Sun, Moon, Mercury, Venus, Mars, Jupiter, Saturn, Chiron, Uranus, Neptune, Pluto and the Lunar North Node. With listings twice every day, at Midnight and Noon GMT. With listings the first of every month at Midnight GMT, for Jupiter, Saturn, Uranus, Neptune, Pluto and the Lunar North Node. I thought I had published my share of astrological tables with that, but then, in the beginning of 2016, as Galactic Saturn arrived at the Galactic Center, I started working with Galactic and Ecliptic charts together, as two mirroring columns, with the timings of Galactic transits on the left, and Ecliptic transit times to the right. These Column Charts turned out to bring the single most important leap in astrological understanding I have ever experienced. And they did so simply by bringing the different transit times together so they can be seen at the same time, both Galactic and Ecliptic. It turned out that Galactic and Ecliptic charts work together in such a way that when the timing of the same Galactic and Ecliptic transits are brought together in parallel, the difference in timing between them opens a window into a symbolic Space which is there in the time between. A Space which very often does not extend very much beyond the confinement of the two parallel timings, but which can relate to other simultaneous symbolic Spaces in an almost cause-and-effect-like manner. So different points in Time are brought together directly or indirectly in ways which show interesting new connections between them, revealing unexpected patterns and perspectives spanning from less than days to several decades, depending on the selection of planets. To look into this, both Galactic and ordinary Ecliptic Ephemerides are needed at the same time, which makes it most handy to find them in the same place. That’s why I started making Galactic & Ecliptic Ephemerides. 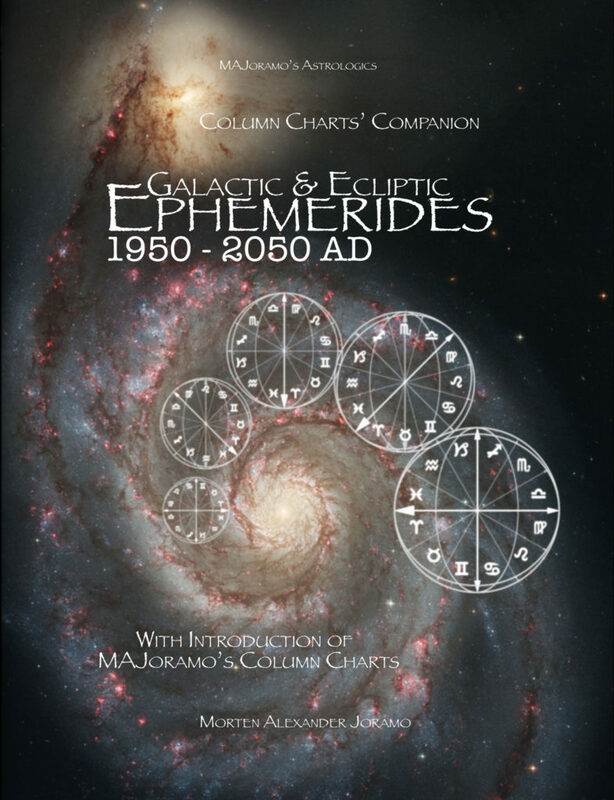 Volume 1 of the Column Charts’ Companion Series has Galactic & Ecliptic Ephemerides 1950 – 2050 AD for both Inner and Outer planets, which can be used to calculate Galactic Charts and make Column Charts from the positions of ordinary Western Astrology charts, what I call Ecliptic charts. With positions listed every day for Sun, Moon (twice), Mercury, Venus, and Mars, and the first of every month for Jupiter, Saturn, Uranus, Neptune, Pluto and the Lunar North Node. All at Midnight GMT. Volume 2 (500 BC – 2500 AD) and Volume 3 (3500 – 500 BC) are meant as research tools for investigating history, archaeo astronomy, reincarnation and other riddles from the past. Together they cover the 6000 years between 3500 BC and 2500 AD, for the Outer Planets only. With positions listed the first of every month for Jupiter, Saturn, Uranus, Neptune, Pluto and the Lunar North Node. All at Midnight GMT. 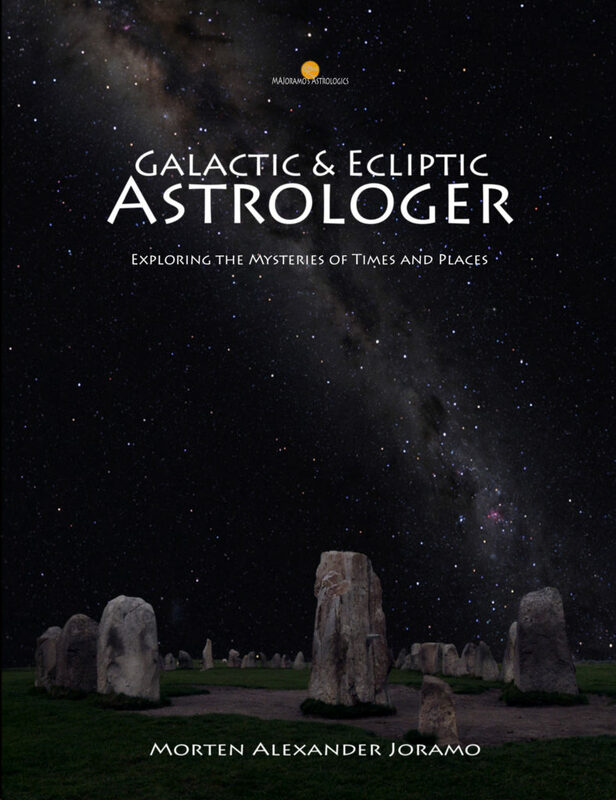 Then in 2017 Galactic & Ecliptic Astrologer came as a new introduction to all the Ephemerides, replacing Volume 1 of the Galactic Geocentric Astrology Series. It brought the possibility of calculating both Ecliptic and Galactic charts from scratch. At least between 1950 and 2050. 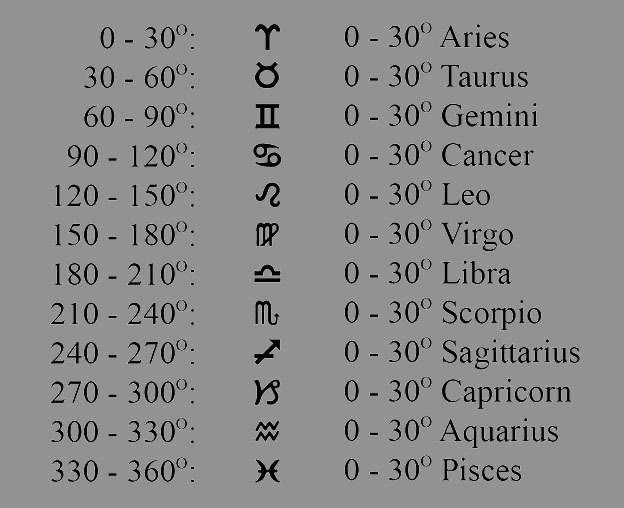 By bringing the tables needed to calculate Ascendant, MC, Vertex and East Point, in addition to the positions of the planets, found in the corresponding Ephemerides. These are tables of Sidereal Time, and of the Sun through both the Galactic and Ecliptic Zodiac (every day through 1950 – 2050 at Midnight GMT), as well as two Ecliptic Tables of Houses. Galactic Ascendant, MC, Vertex and East Point are all found by converting their positions found in the Ecliptic Table of Houses by looking up their corresponding Galactic positions in the Galactic & Ecliptic Zodiacs & Sidereal Time table. More explanations in the book. The point here being that now it is possible to make Galactic and Ecliptic charts quite accurately off-line, even without the use of a computer. Who knows when that can come in handy, but I am very happy that all these tables now have come into physical existence. They represent potential understanding of times and places in a way no other method can provide, at least as far as I know. For me personally, the inclusion of the Galactic Dimension into Astrology has far more than doubled the value of this ancient science, art and language. Because with two Zodiacs the whole thing becomes three dimensional, with totally new things to explore. Particularly in that Space between each Ecliptic and its corresponding Galactic transition. I hope you get to become just as excited about these books as I am. Perhaps particularly now that they also have become available as pdf eBooks, which could be unbelievably handy. They have truly been a long train running so far. And who knows, it may not have stopped running quite yet. As a matter of fact, I am planning a new series of Galactic & Ecliptic Ephemerides where all included planets, the Sun, and the Moon, will be listed every day. Because it’s more handy that way. All these astrology books are available from Amazon, and also the rest of them will be made available as eBooks from Gumroad. Potential for Economic Crash and a New Great Depression! Today’s dominant authority is the power of money, and that power is set to go through some extraordinary changes in 2018. As Saturn returns to a very familiar place at zero degrees Capricorn, which is now also Saturn’s own spike of the Great Cross*. That means the very foundation of our lives is going to change in the year now upon us. To see why, we must first go back some 300 years to the founding of the first modern central bank, the Bank of England. The Bank of England started with an original capital of £1,200,000. The money was brought about by the so called subscribers entered on the subscription lists opened in “the Mercer’s Chapel” 21 June 1694. 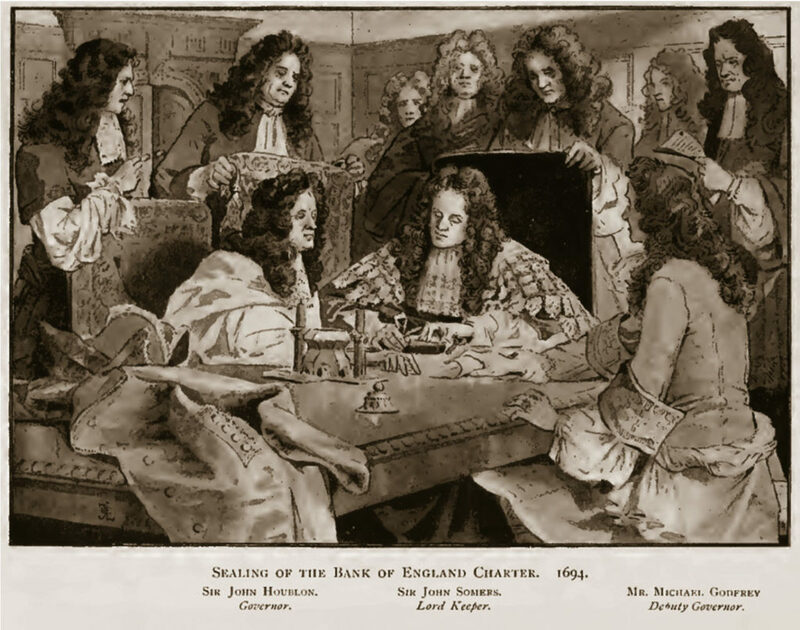 By noon on 2 July the subscriptions were completed, and on 27 July 1694 the Royal Charter was granted, turning the subscribers (including the English Crown) into the Governor and Company of the Bank of England. Also Uranus placed at the Galactic Anti-center in the Galactic chart is worth pointing out, as it gives the whole endeavour a potential global scope. To see if there is a connection between this chart and economic downturns, we start with the Panic of 1873. 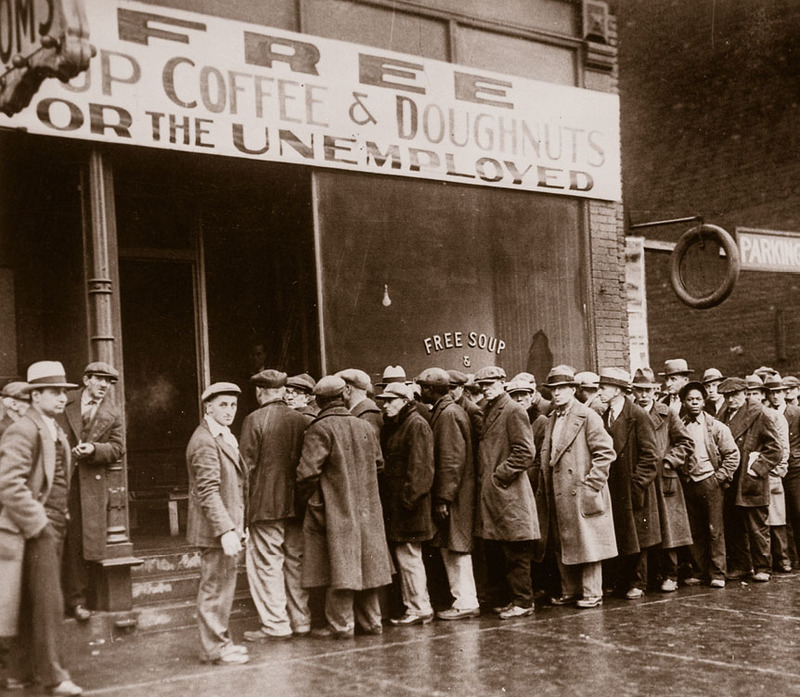 It was a financial crisis that triggered a “Long Depression” which was called the Great Depression all the time until the 1930s, when what we today call the Great Depression became even worse. The planet (or Plutoid) symbolizing a central bank, is Pluto, Lord of the Underworld. In September and October of 1873 Galactic Pluto was at 355 degrees, exactly on Bank of England’s Uranus (rapid changes and awakenings. As well as railroads!). While Galactic Uranus hit Jupiter and Ecliptic Uranus hit the Midheaven at the same time. 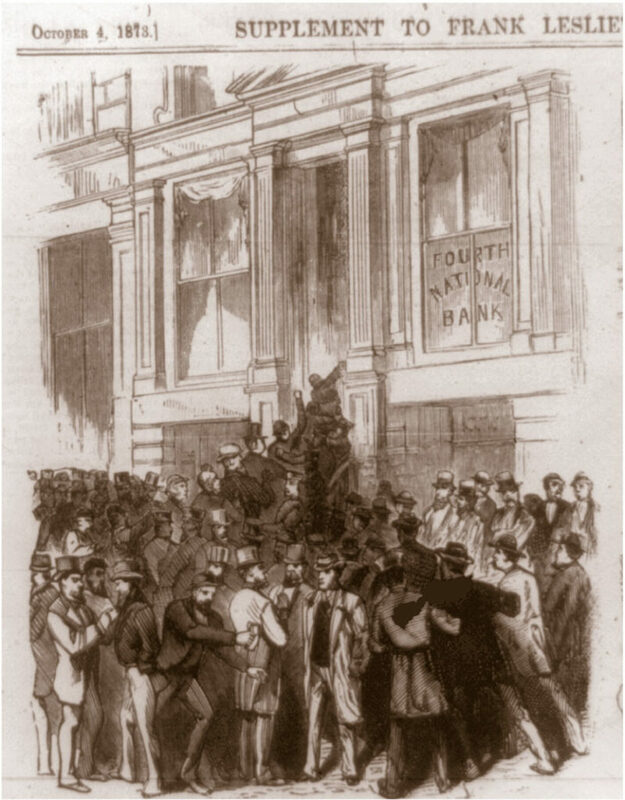 It is thought that two important underlying causes of the Great Depression of 1873 was American post Civil War inflation, and rampant speculative investments in railroads. It is also significant that Ecliptic Pluto and the Lunar North Node were in exact conjunction in July 1873. That can always bring dramatic changes. So it seems the happenings of 1873 make a whole lot of sense in relation to the chart for the Bank of England. Moving on to the Wall Street Crash of 1929 and the following decade we still today call the Great Depression, we find Jupiter at (G)354, again a trigger on Bank of England’s Uranus, which again makes things happen swift as lightning. And Saturn was at (G)179 and (E)267 those days in October 1929. Which is just a couple of degrees from Saturn’s position in the Bank of England chart. But perhaps just as ominous, Pluto at (G)10.8 and (E)109.6 would be spending the whole time of the Great Depression to catch up with its position in the chart for the Bank of England, at (G)15.41 and (E)121.83. Not only that, however, Pluto in 1929 had moved half a round shorter than Pluto of 2018, as it was in conjunction with Pluto’s planetary North and South Node, respectively. Clearly, we are presently moving into quite similar dire times as in 1929. And now, as back then, most people will probably not have a clue as to what is happening before it’s too late to do much about anything. The fake news and propaganda of the Cabal-owned western mainstream media will see to that. Not so for the Cabal of Central Bankers, however. They may well not only know about this beforehand, they may even have planned it. As we note that Saturn hit Bank of England’s Saturn not only in 1929, but also in 1900, 1958, 1988, as well as coming up now in 2017-18. And that there was not only the Wall Street Crash of 24-29 October 1929, but also the Panic of 1901, the Recession of 1958 – also called the Eisenhower Recession, and the Norwegian Financial Crisis which started in 1988. As well as the Black Monday of 19 October 1987, when Galactic Saturn had just passed the Galactic Center and was at (G)175. Which is significant because the Galactic Center in the Ecliptic Zodiac is now less than 2 degrees away from Bank of England’s, or The Central Bank’s, Saturn. Then there was also the Economist Magazine from 9 January 1988, with the picture of the Phoenix on the cover. Rising from the burning fiat paper currencies with a gold coin named after itself around the neck. A gold coin with the year 2018 stamped upon it. So when looking ahead from 1988 they seem to have been sure they would get in position to have a global gold-based currency by 2018. Or in 2018 at the latest. When looking ahead from 1988 they must also have used astrology, to be able to forecast their intention for the next Saturn cycle, or at least for the end of the coming cycle, in the chart for the phenomenon of Central Banking. Which is controlled by the same Rothschilds as is the Economist Magazine. But there is an even deeper side to all of this. Because the reason why the Central Banking Saturn is so powerful, is because of its proximity to one of the spokes of the Great Cross. And because of the approaching Galactic Center in the Ecliptic Zodiac. The Great Cross is caused by Precession and appears only once every 12,900 years. And the Great Cross is here now.Exact in 1998, but within one degree of exact for 72 years in both directions. That means that there is a special energy symbolized by the four spokes. And so this phenomenon of the central bankster’s Saturn is amplified by these mentioned factors. 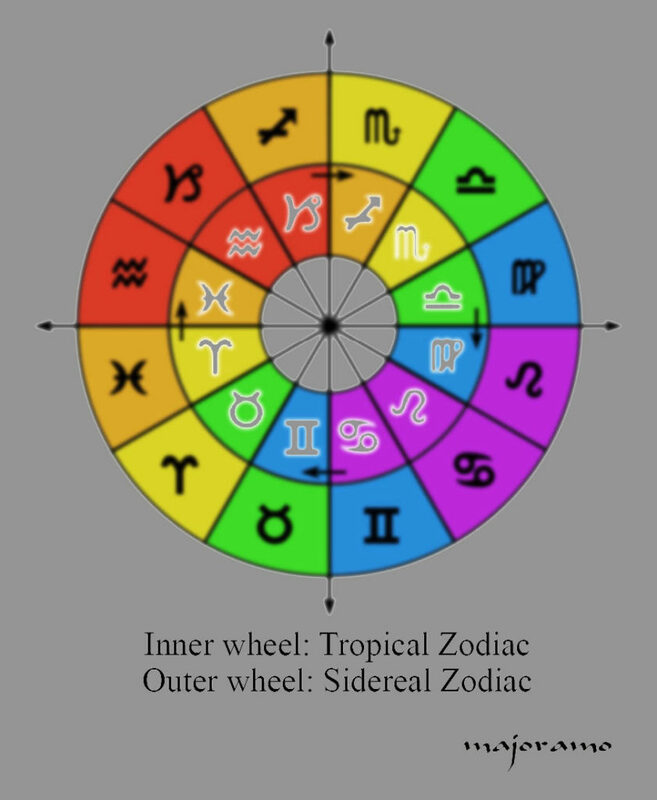 The spokes of the Great Cross are mentioned in the Bible in both Ezekiel and Revelation, because each spoke goes through the beginning of one of the Fixed Sidereal Signs – those that are wonderfully portrayed, but imprecisely positioned, as the Zodiac Constellations. 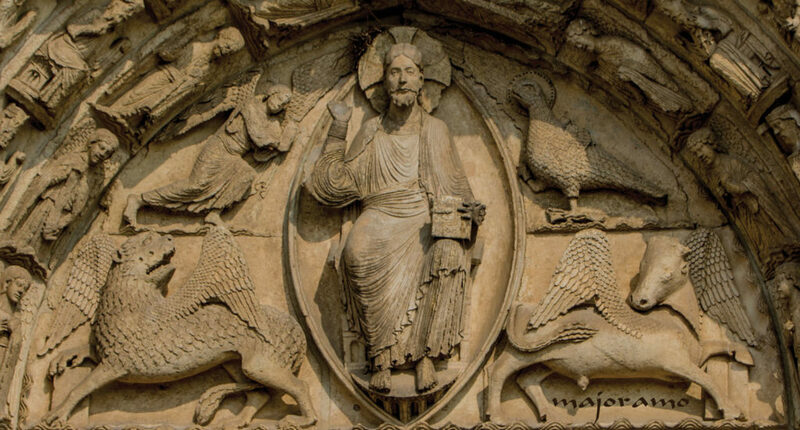 And the four Sidereal Signs on the spokes of the Great Cross are Taurus the Bull, Leo the Lion, Scorpio the Eagle, and Aquarius the Angel. These are the Angles of the Apocalypse, and the one we are dealing with here is the Scorpio-angle, also symbolized by the Eagle. Not unlike the Phoenix on the cover of the Economist. Something which is not very likely to be coincidental. This probably should have been the end of the old system and the power of the Central Banksters, but it wasn’t. When Saddam Hussein started selling his oil in Euros in November 2000, the ensuing panic in the White House of Washington DC turned into the War on Terror. Their own home-made terror to be precise. In order to save the Petrodollar. And when the Financial Crisis broke out in 2008, and the whole system threatened to come crashing down, it was plastered over with incessant money-printing, while nothing was really fixed. But perhaps they did not mean to fix anything, just to keep the fiat-dollar-economy afloat long enough to uphold Saturn’s appointment with the Scorpio-angle in 2018. 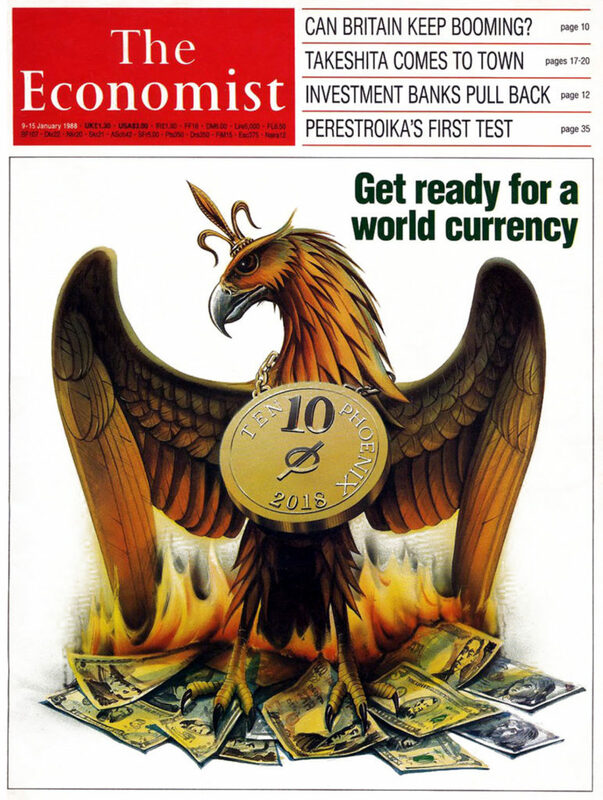 When the plan seems to be to crash the dollar and have a new currency show up like a Phoenix out of the ashes. Which by now could be the only option left for the Cabal, to show up as the Central Bankers behind something like a Gold-based Yuan and a New World Order out of the East. Or a new crypto-currency. Other than their complete and utter failure. Which is what we all hope for, really. So that the Age of Aquarius can start fresh. Without them ruling and fooling us. But what we definitely do not want, is for the Cabal to be able to start another war. After Yugoslavia, Afghanistan, Iraq, Somalia, Sudan, Libya, Lebanon, Yemen, Syria, Ukraine and more, all in the name of something other than the truth; of trying to save the doomed Petrodollar. We have had quite enough of wars, thank you. And of refugees flooding into Europe from these countries, broken by the US coalition forces and their ISIS mercenaries. One thing is for the Cabal to have robbed the world blind economically, they simply cannot be allowed to crash the world physically as well. They have been ruling this planet for thousands of years, and if we now use wisely this chance to stop them and bring them down, the Age of Aquarius could become wonderful indeed. All it takes is an Awakening. As to the timing, economic crashes seem to have a tendency to show up in October. This time may be different, however. Not the least because Mars (war, sparks and triggers) will pass the Scorpio-angle of the Great Cross on 17-18 March, will hit Saturn in the Bank of England chart 15-27 March, and will conjunct both the transiting Saturn and Pluto in April 2018. Specifically, Mars’ Galactic & Ecliptic passing of Saturn will be 4-7 April. And the same with Mars conjunct Pluto from 26 April (E) to 2 May (G) 2018. As I am finishing this article on 17 March 2018, the UK, supported by the rest of the Allied Forces and what Paul Craig Roberts call the Presstitute Media, are desperately making ridiculous accusations against Russia of having poisoned a Russian double agent in Salisbury, England. Without the slightest shred of evidence. Because they want to give the world a war to think about, instead of their own unforgivable crimes against humanity. Who knows what will happen next and how it all will go, but it is all connected to the fact that the Western Dollar-based economy is dying. And the US and Allied hegemony is falling. So it may not hurt to be a little prepared and alert, since the breakdown of much that was made in the Age of Pisces – the Age of Deception – has already started. And there are great changes on the horizon also in the years immediately ahead. Something which should perhaps not come as any great surprise, now that we have also arrived at the time which both Ezekiel and Revelation alluded to; the Time of the Great Cross in the Wheels of Heaven. For more, see Galactic & Ecliptic Astrologer, and The Great Pyramid Timeline.